Today was not a good day, strictly speaking. The night before had been spent trying to figure out whether I wanted to cry or not, after a day of highs. It was discouraging, that after a whole day of good feelings, I ended the day wanting to cry, but not being able to really release myself to cry. I managed to get to sleep anyway, but it didn’t feel good. I woke up and still felt unwell. The morning was spent trying hard to get out of bed, and maintaining the guinea pigs’ cage. After that, we spent about half an hour seriously explaining to the boys what depression is, in ways that they could understand, and highlighted how serious suicide is, and that they must always speak to an adult if their friends or they themselves felt like harming themselves over issues such as results or relationships. We also taught them not to trivialise suicide and depression, before we headed out for lunch. After lunch, we headed over to the arcade for the second day in a row. I think the worst part for me was when my elder boy tried to push his brother into doing things his way, despite me telling him to back off and let his brother have his own room to explore. I ended up shouting, not once, but three times, as the elder boy kept trying to take over the younger boy’s chances. I clammed up totally after that. I couldn’t breathe well for a while after the outbursts. I couldn’t, and didn’t want to speak. I listened to my music, and either whispered answers, or gave monosyllabic answers. My wife was getting worried. On the way home after dinner, I spoke only when it was absolutely necessary. When we reached home, after putting down our things and washing our hands, I managed to capture Heart from the cage. 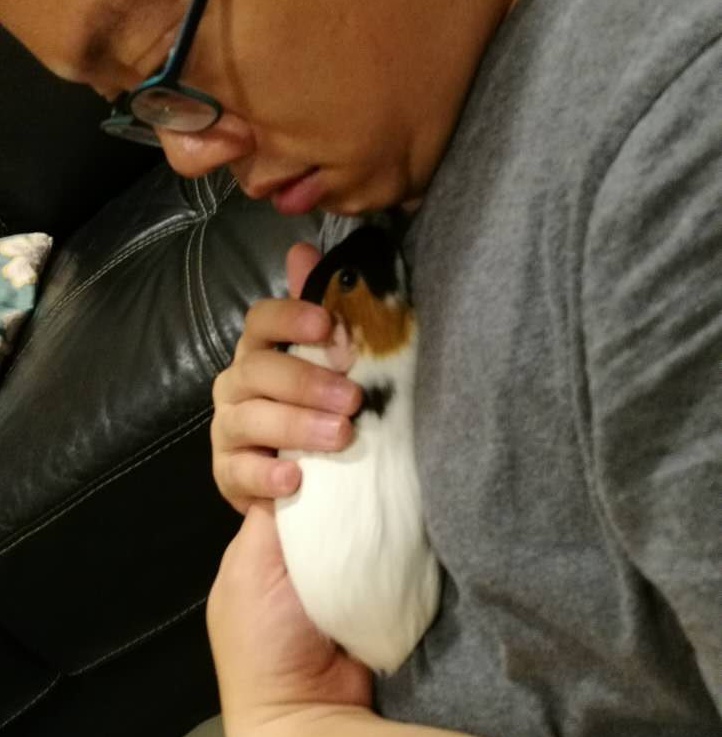 I cuddled her to my chest, and just sat there for about 20 minutes. I don’t know when it happened, or how it happened. By the time I released her back into the cage, I was able to talk, and the tension was released. I was really tense and deep in my moodiness when I first started carrying Heart. I went on to complete two full sets of my dumbbell exercises, and was able to laugh and joke with my wife and our best friend that night. My wife was so relieved and happy to see the change in me. I at least have one good thing to report to my doctor come Monday. There’s still a lot of room for improvement, but pet therapy works. For now.